I remember that when I first learnt how to ride a bike (properly, without stabilisers) I was fine as long as I didn't think about what exactly I was doing. As soon as I realised that I was propelling myself along the road perched above two impossibly thin wheels, with nothing but air and pedal-power to keep me upright, wobbles invariably followed. The same applies to prayer, which at times can feel as natural as breathing - until I start thinking about what I'm doing, or wonder at the sheer amazing awesomeness of it. Prayer at Friday night's Nightfever felt effortless. 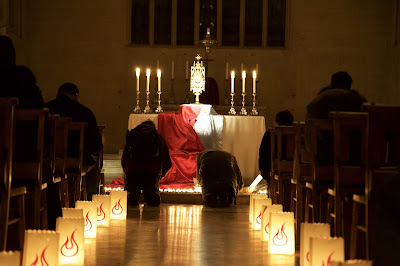 The ambience undoubtedly helped, lulling me into stillness: the simple beauty of Blackfriars lit only by candlelight; adoration in the air as well as in very fact; prayerful music and singing, and the general atmosphere of hushed reverence throughout. The stillness was filled with the quiet movement of people going to the front to light candles or simply to pray more fervently; this is what Nightfever is about, who it is for, and each pray-er simply becomes part of the whole, and part of my prayer. So I sat in stillness, with God, but somehow also embracing all those around me: the passers-by invited in to light candles; the students inviting and ushering them in; those who came deliberately, maybe bringing anxieties or simply a need for space. In the darkness I could make out several of the student ushers by their height or build, but others remained a mystery. I noticed one pair of patterned trousers going busily up and down the aisle: as I left I met their wearer, who was happy to know I'd noticed her, equating each sighting with an extra prayer. But in truth, there were no "extra" prayers: there was simply prayer, an awareness, a stillness, a being-with, a gentle tide washing over me and flowing out, over everyone else. Whenever I leave I am thanked for having been present, and for my prayerful support. Really, though, I feel I'm the one who should express gratitude: the response it's been a real pleasure is never more truthfully uttered than as I leave Nightfever.